Spectacular and rewarding specimen tree. A fabulous Spring blossoming tree. Fruits sweeten beautifully if picked and ripened for a few weeks. Perfect for making jellies, as well as cooking in mixed fruit pies and puddings, fresh from the trees. Supplied potted in a 5L pot. Medlars are a somewhat old-fashioned fruit in today's supermarket world, but are a spectacular and rewarding specimen tree. A fabulous Spring blossoming tree, it produces gorgeous pink blossom, and in late Autumn unusual fruits, not exactly a thing of beauty, and which are tart if eaten from the tree, but sweeten beautifully if picked and ripened for a few weeks, and can keep for Months in cool and dry conditions. They then make excellent jellies, as well as cooking well in mixed fruit pies and puddings though, fresh from the trees. Something really different, yet easy for the productive orchard garden! Leaves and flowers can be burned byu late frosts and drying winds, so plant in a sheltered area and keep well watered at all times. 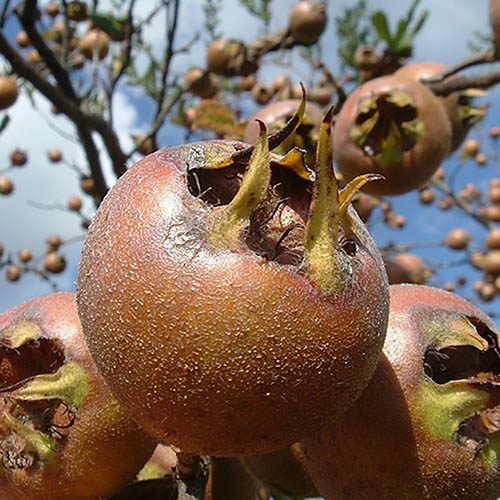 Medlars grow best in a deep, fertile, well-drained soil. Select an appropriate spot in a warm, sheltered, sunny site with enough space to allow your plants to grow. Dig a hole twice the width of the roots, forking over the bottom to loosen the soil, then add some good quality fertiliser, compost or well-rotted manure. We've found that a square hole is better than a round one as the new roots, once they reach the edges tend to grow in a circle round the circumference of the hole whereas when they reach the corners of a square hole, they find it easier to grow through. Plant at the same depth as the tree was in its pot, then holding the tree upright in position with one hand, slowly backfill the hole with soil, so the soil falls back around the roots. Compact the soil around the plant with your heel to ensure good contact around the roots. For all trees, use our Tree Planting Kits – including stakes, rubber ties and Mycorrhizal fungi, which is proven to aid tree growth and development. Push 40cm of each stake into the soil next to each tree. Make a figure of eight around both the trunk and stake with a tie and fasten it off. Spread Mycorrhizal granules in contact with the roots when planting. Mulch around the base of the plant with a collar, compost, gravel, bark etc. Water the plants at least weekly – especially in dry weather – for the first 8 weeks. In March apply a general-purpose fertiliser and mulch with well-rotted manure or compost. Prune in winter in order to maintain a good shape and encourage flowering and fruiting. Remove any damaged, crossing or damaged branches at the same time.